Will Samsung’s 2017 Semi Capex Deliver Knockout Blow to Competition? IC Insights has revised its outlook for semiconductor industry capital spending and will present its new findings in the November Update to The McClean Report 2017, which will be released at the end of this month. IC Insights’ latest forecast now shows semiconductor industry capital spending climbing 35% this year to $90.8 billion. 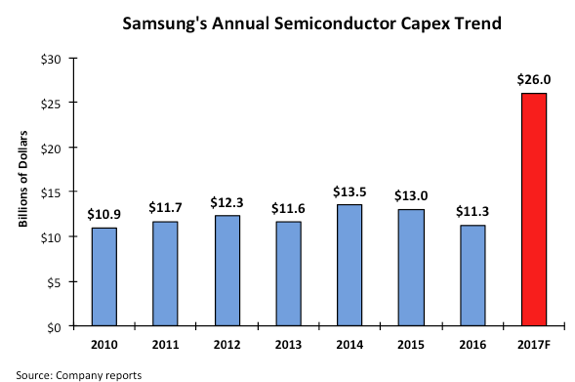 Figure 1 shows Samsung’s capital spending outlays for its semiconductor group since 2010, the first year the company spent more than $10 billion in capex for the semiconductor segment. After spending $11.3 billion in 2016, the jump in capex expected for this year is simply amazing. To illustrate how forceful its spending plans are, IC Insights anticipates that Samsung’s semiconductor capex of $8.6 billion in 4Q17 will represent 33% of the $26.2 billion in total semiconductor industry capital spending for this quarter. Meanwhile, the company is expected to account for about 16% of worldwide semiconductor sales in 4Q17. IC Insights believes that Samsung’s massive spending outlays this year will have repercussions far into the future. One of the effects likely to occur is a period of overcapacity in the 3D NAND flash market. This overcapacity situation will not only be due to Samsung’s huge spending for 3D NAND flash, but also to its competitors in this market segment (e.g., SK Hynix, Micron, Toshiba, Intel, etc.) responding to the company’s spending surge. At some point, Samsung’s competitors will need to ramp up their capacity or loose market share. Samsung’s current spending spree is also expected to just about kill any hopes that Chinese companies may have of becoming significant players in the 3D NAND flash or DRAM markets. As our clients have been aware of for some time, IC Insights has been extremely skeptical about the ability of new Chinese startups to compete with Samsung, SK Hynix, and Micron with regards to 3D NAND and DRAM technology. This year’s level of spending by Samsung just about guarantees that without some type of joint venture with a large existing memory suppler, new Chinese memory startups stand little chance of competing on the same level as today’s leading suppliers. Additional details on capital spending and other trends within the IC industry are provided in The McClean Report—A Complete Analysis and Forecast of the Integrated Circuit Industry (released in January 2017). A subscription to The McClean Report includes free monthly updates from March through November (including the Mid-Year Update), and free access to subscriber-only webinars throughout the year. An individual-user license to the 2017 edition of The McClean Report is priced at $4,090 and includes an Internet access password. A multi-user worldwide corporate license is available for $7,090.